Shop Empirical Labs Lil frEQ Model EL-Q Equalizer from AMS with 0% Interest Payment Plans and Free Shipping. The Lil FrEQ is a modern digitally controlled analog EQ offering unprecedented performance, and control over equalization. 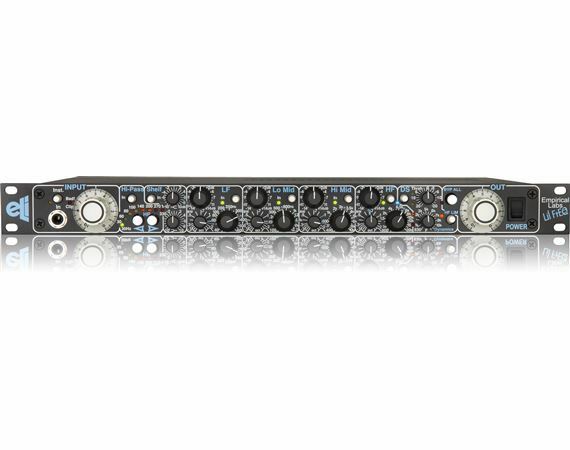 In a single height unit, Empirical Labs offers seven frequency shaping controls and one dynamic section… and every frequency is covered in at least two sections. The High Pass section is a really easy to use sharp filter that cuts all content below one of eight preset frequencies from 30-330 Hz. This filter is very steep and has a special shape that prevents frequencies from thinning out just above the cutoff point. The corner frequency is selected using up/down buttons, and indicated by LEDs that glow softly when the section is bypassed, and brightly when the section is engaged. These two knobs function similarly to the familiar “bass and treble” tone controls found on many consumer audio playback systems; however, these are designed to a much higher performance standard, providing exceptionally smooth and musical boost and cut on the high and low frequencies. The Lil FrEQ has four sections of fully parametric EQ (LF, Lo Mid, Hi Mid and HF), with each section featuring individual gain, bandwidth (Q) and frequency controls. It may be the cleanest parametric EQ section ever produced, operating below .0007% THD (Total Harmonic Distortion) even at extremely high audio levels. Try finding those specs anywhere else! The DS section provides the highest performance, easiest to use, and possibly most natural sounding “De-esser” ever built. This powerful tool combines tunable filters with a compressor-like circuit that can help contain and control excessive high frequency content such as sibilants or other sharp transients, especially in the absence of other lower frequency content. It can also function as a one of a kind soft knee High Frequency limiter, which is one of the main things responsible for the Lil FrEQ becoming the go-to vocal EQ for engineers everywhere. It has been used on many acclaimed albums and major live performances all over the world, becoming the “go to” EQ for key tracks like lead vocals, snares, and bass. There are now dozens of hit record vocals that were processed thru the Lil FrEQ. Empirical Labs has packed an awful lot of power and flexibility into the Lil FrEQ. Empirical Labs knows you will love it! Frequency Response - 5 Hz to 140 kHz on transformerless inputs and outputs. Dynamic Range - 120 dB from maximum output (.1% clipping) to minimum output. Greater than 110 dB signal to noise. Dynamic Time Constants - Attack is approximately .5 mS. Release .04 sec, fixed internally.